I love these cakelets! Soft and fluffy cake delicately flavored with white chocolate coated in green candy melts and covered in sprinkles; the perfect amount of softness and crunch. 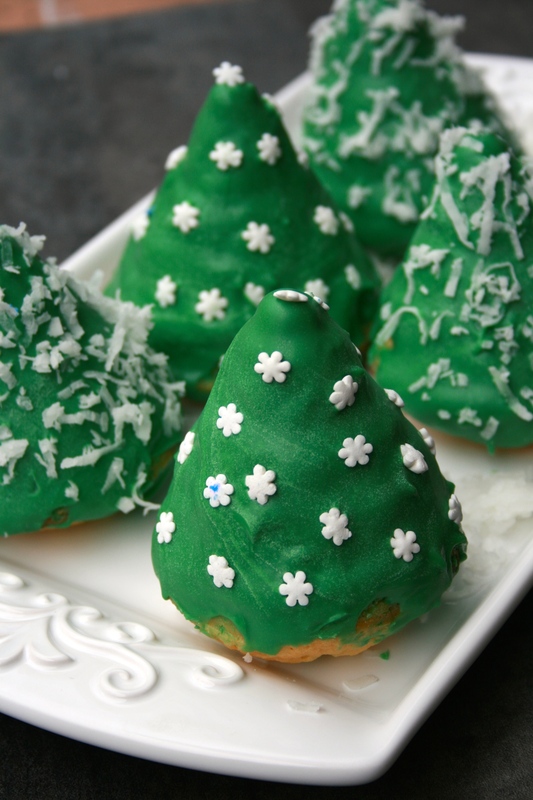 These are the perfect Christmas Eve dessert!! Preheat the oven for 350F. 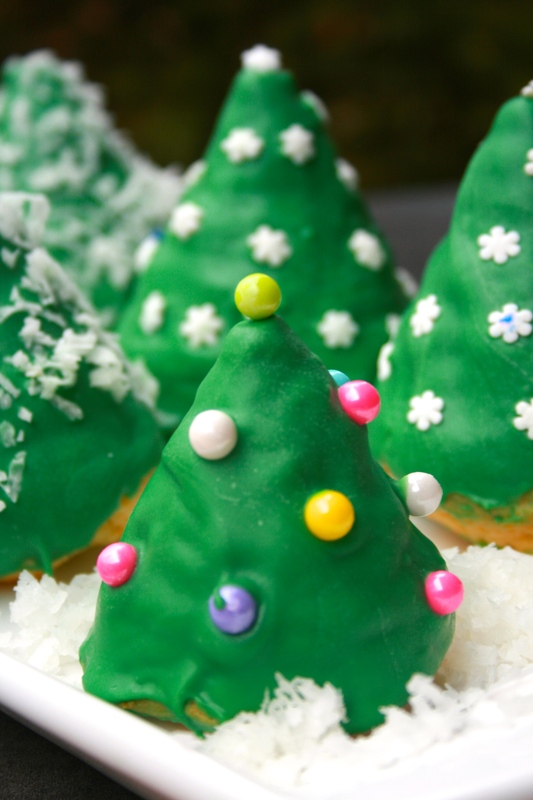 Grease a silicon Christmas tree pan with Bakers Joy. Melt chopped chocolate in a double boiler and let cool for ten minutes. Whisk together flour, baking powder, a baking soda and salt; set aside. Cream butter and sugar for 3-4 minutes until light and fluffy. Add eggs one at a time, and buttery vanilla bakery emulsion, beating after each addition. Stir together the milk and sour cream. With mixer on low speed, alternately add flour mixture and sour cream/milk, mixing until just combined. Gently mix in white chocolate. Fill Christmas tree pans about 3/4 of the way through. You will need to do this twice. Bake for 30-35 minutes, or until a toothpick comes out clean. Release cakes from molds after cooling and chill in fridge for at least 30 minutes before rolling in melted candy melts and decorating in sprinkles. This cake is. so. good. 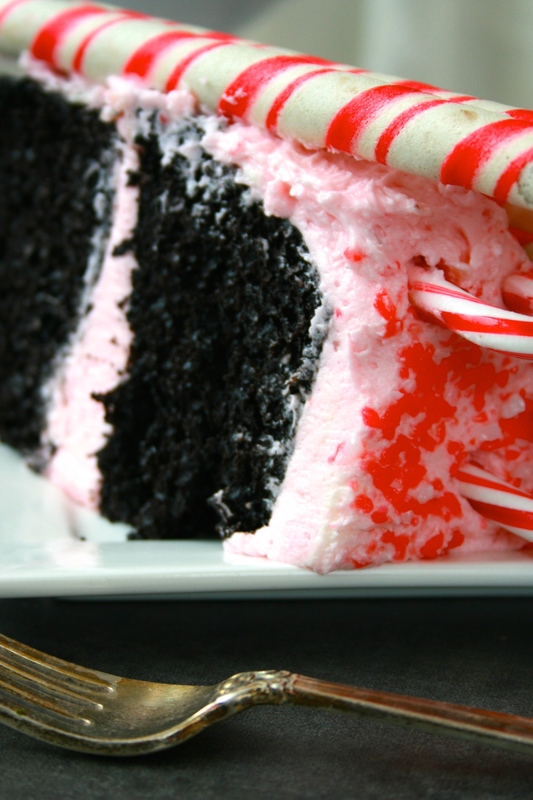 A deeply chocolaty mocha cake with smooth, fluffy, and almost whipped cream like peppermint frosting. 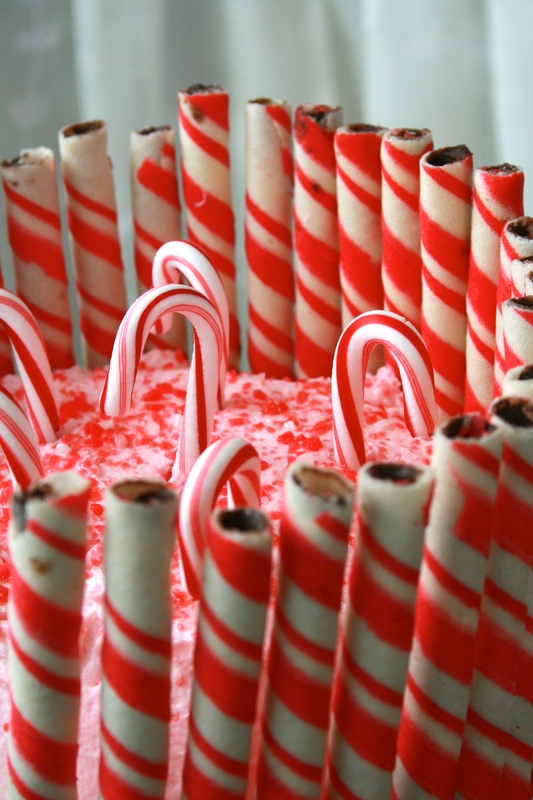 I decorated the cake with mini candy canes, peppermint pop rocks, and peppermint rolled wafers. It’s perfect for Christmas. Heat oven to 350F. Grease, line with parchment paper, and flour two 6-inch round baking pans. Stir together sugar, flour, cocoa, espresso powder, baking powder, baking soda and salt in large bowl. Beat in boiling coffee. Pour batter into prepared pans- you will have left over! Bake 35 to 40 minutes or until wooden pick inserted in center comes out clean. Cool 10 minutes. Then remove from pans to wire racks. Cool completely before brushing on syrup. In a small saucepan, whisk flour into milk and heat, stirring constantly, until it thickens. You want it to be very thick, almost like a paste. Remove from heat and let it cool to room temperature. It must be completely cool before you use it in the next step. While the mixture is cooling, cream the butter and sugar together until very light and fluffy, about four to six minutes. Then add the completely cooled milk/flour mixture and beat heavily. If it looks separated, you haven’t beaten it enough! Beat it until it all until it almost resembles whipped cream, about six minutes. These are my favorite muffins. 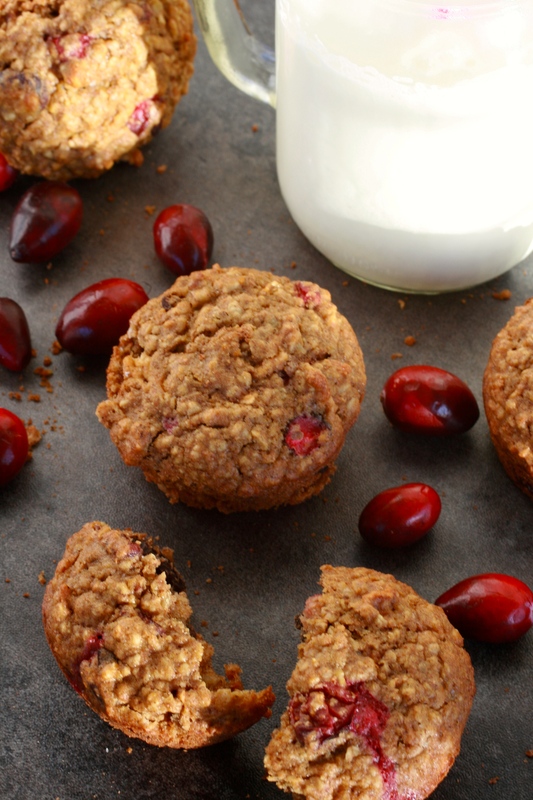 Soft, fluffy, a little spicy, and bursting with tart cranberries. They are so easy to make and infinitely adaptable. I give you the recipe for a really delicious spiced sugar topping, but it’s not in the pictures- but use it! Lightly spoon flour into a measuring cup and level with a knife. With a spoon, combine first 8 ingredients in a large bow. 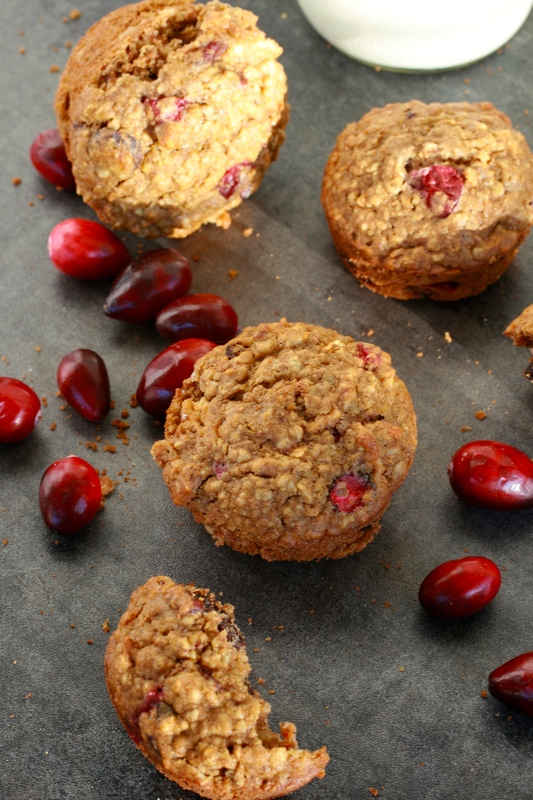 Stir in oats, shredded apple, dried cranberries, and cranberries. Make a well in the middle of mixture. Combine buttermilk, orange juice, oil, vanilla, and egg; add to the dry mixture, stirring just until moist. Stir in boiling water. Let batter stand 15 minutes. Spoon batter into a greased muffin tin. Bake for 20 minutes or until muffins spring back when touched lightly in center. Mix together the sugar and spices. Dip the muffins in the melted butter and then in the sugar. 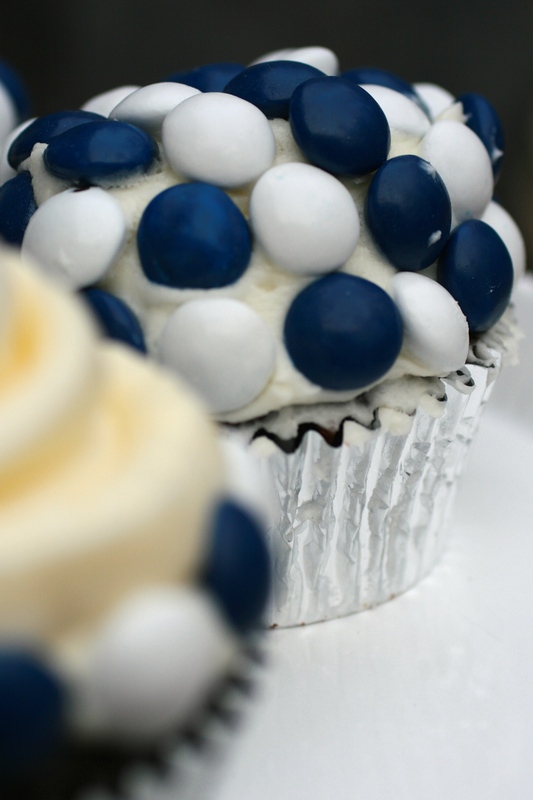 These are definitely the best cupcakes I’ve ever eaten. 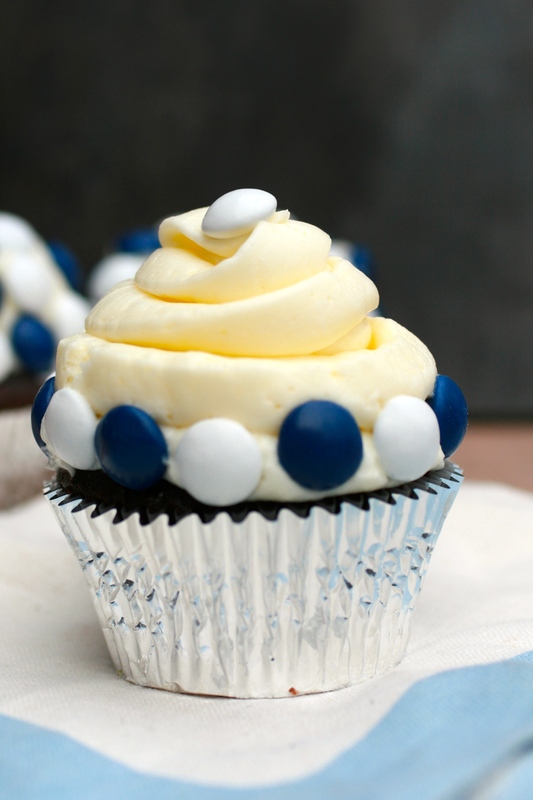 Moist, fluffy, and deeply chocolaty cupcakes stuffed with a peppermint patty and topped with the fluffiest peppermint buttercream. The chocolate cupcake is my favorite recipe ever. 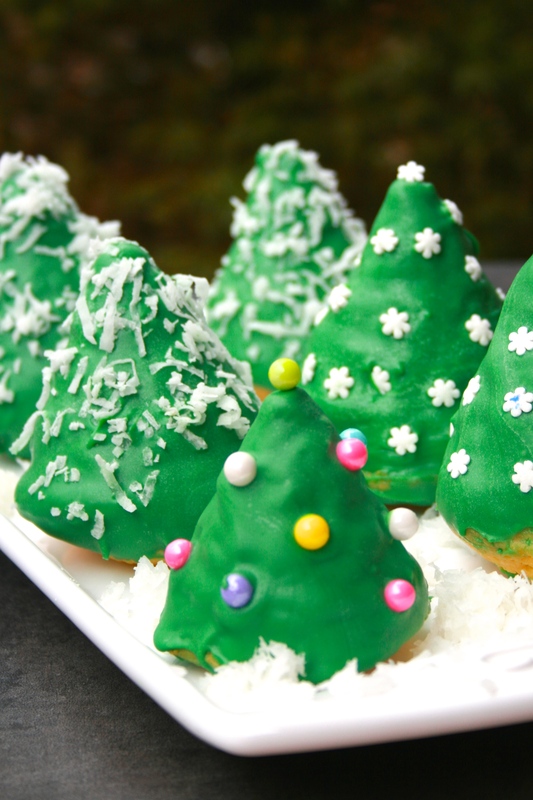 They are perfect for the Christmas season. I decorated them with York Peppermint Patty Pieces and Mini Peppermint Patties. So good!! Preheat oven to 350F and line a muffin tin. Place the chopped chocolate and cocoa powder in a medium bowl. Pour the hot coffee over the chocolate/cocoa mixture and stir until smooth; refrigerate the mixture for 20 minutes. Whisk together the flour, sugar, salt and baking soda in a medium bowl; set aside. Whisk the oil, eggs, vinegar and vanilla extract into the cooled chocolate mixture until smooth. Slowly add the flour mixture and stir until smooth. Place about 3 tablespoons of batter into each liner and top with a peppermint patty. Bake until the cupcakes are set and just firm to the touch, about 19 minutes. Beat butter for 8 minutes on high speed. Add remaining ingredients and mix on low speed for 1 minute, then on medium-high speed for 6 minutes. 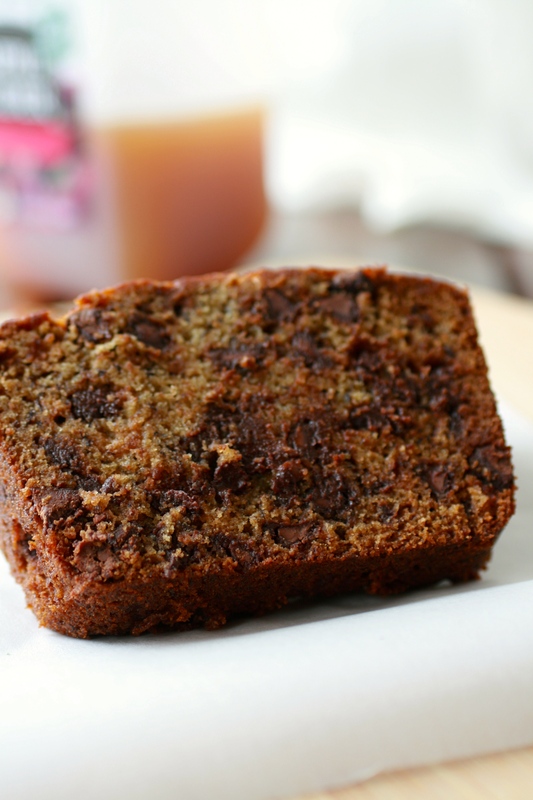 This is the best banana bread I’ve ever had. It’s soft, moist, stuffed full of chocolate chips, and had a perfect crunchy golden top. To make it even better, you don’t even have to use a mixer. 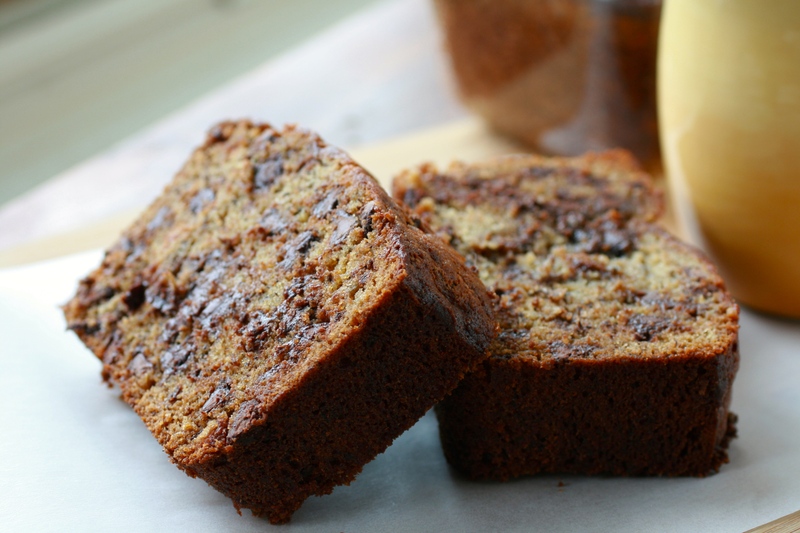 This is the perfect thing to make when you have a bunch of brown bananas or some chocolate chips. Preheat oven to 350 and grease an 8 inch loaf pan. In a small bowl, stir together the dry ingredients. In another bowl, mix together the sugar and butter. Beat in the eggs and banana puree until just mixed together.